We practice rapid web development. Each Mr Monkey project is launched within 2 weeks. This focuses the mind on the things that really matter. More features are added as the project demonstrates its success. 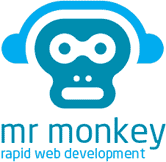 Mr Monkey is a web development team with an important distinction: our projects are either fully or part-owned by us. This ownership is our driving force in making the project a success. In the traditional model of web development, a customer pays a web developer to build them a website. In our model of co-ownership, we share the profit (or loss). We all have the same goal , so success is more likely. If you are looking for a free-thinking business partner for your web project, get in touch.